I been running PG LLR Tasks hard so I know the issue is not my Host of 6 months of age. What are the practical implications for those of us who have been running predominantly Continuous Gravitational Wave search O2 All-Sky 1.01 tasks? Should we be aborting all existing O2 All-Sky 1.01 tasks then? While we wait for an official answer I would suggest setting Einstein to no new tasks and let it finish off whatever tasks you have on board. It may turn out that the data is usable. Please don't abort existing tasks! We hope to make use of these results, and letting them run to completion also means that you'll get properly credited for the work. I don't quite get this message - is there anything we can help you with? Hmmm. In the last 24 hours I received some new O2 All-Sky 1.01 tasks. I thought these were on hold. I think that no new work will be issued but already started workunits will have tasks generated to fill the quorum. If you look at the Task IDs of the "O2 All-Sky 1.01" tasks you received they all end with _X where X is greater than 1. New tasks for a workunit will have _0 and _1 at the end of the Task ID, a resend generated because one of the tasks failed or wasn't returned will have higher numbers. I finished one in 4 days on my HP laptop running SuSE Leap 15.0 which has a new kernel 4.12 equal to that of the Enterprise version of SuSE Linux. Another is nearing its end. because some questions have surfaced related to the de-jittering used in the preparation of the LIGO O2 data. These must first be understood. Is it just my rigs or does this include an issue with Continuous G W tasks hording CPU's away from GPU cards and doing odd things with "Options-computing preferences-usage limits? All this works perfectly with just our gamma-ray tasks. Throw back into the mix some new C.G.W. tasks and I hope my dual and triple GPU computers stay fully working! I have 3 systems running Einstein@Home tasks, 2 of them 24/7. 3 weeks after the announcement of the project on hold, I'm still getting tasks, several of the most recent ones end with _0, and they now start with LATeah. I'm no longer clear on what I'm helping with, I hope Bruce Allen or someone else on the project could shine some light on the subject. There's 2 different CPU searches running on Einstein@home, one is the "Continuous Gravitational Wave search O2 All-Sky" search discussed in this news announcement and the other is called "Gamma-ray pulsar search #5". As the announcement here states the Gravity wave search has been stopped and no new tasks will be issued until further notice. On the other hand the Gamma-ray search is still ongoing. When I take a look at the tasks for one of your computers I see that you have been working on the Gamma-ray search and that corresponds to the task name starting with "LATeah". If you follow the link I posted you will see that the name of the tasks in the leftmost column start with "LATeah" and the application in the rightmost column is named "Gamma-ray pulsar search #5 v1.08 () windows_intelx86" for CPU tasks. Tasks for the Gravity wave search have names starting with "h1_". Awesome, it's all clear now. No. This would be a potential problem in how they prepared the data we're crunching. Interesting feed, the feeling is that dejittering ... makes some data unavailable for use... The same is true for camera filters! Looks like the 1st few hundred test WU's for the next GW search have been released. I just noticed Gravitational All-sky search on LIGO O1 Open Data 0.01 jobs showing up in my BOINC managers. Does this mean that the problems with the previous LIGO jobs has been fixed? You need to tell the boinc client you don't want to do any more work for E@H, if you don't it'll assume you do and keep requesting more to replace whatever you manually cancelled. 1) Set its resource share to 0 in settings on the website and do a project update to pull down the changed configuration. This will stop E@H on all of your computers if you have more than one. Depending on the order that things are processed, it may or may not pull down one final batch of work first. 2) On the projects tab of the boinc client, select E@H and click No New Tasks or Suspend. Either will stop any new E@H work from being done. The functional difference is that NNT will still run any work already downloaded as normal (unless you manually abort it), suspend won't run them but will leave them lingering in your task list until they expire of old age unless aborted. 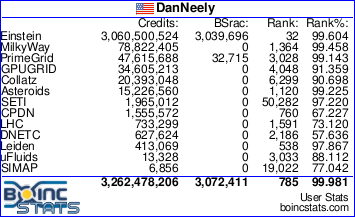 4) Uninstall Boinc entirely using whatever the standard method for your operating system is. I have completed 8 gravitational wave search tasks on my new HP PC with a Ryzen 5 1400 CPU and they all validated.